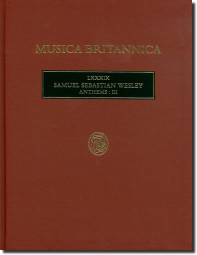 The third and final volume devoted to the anthems of S. S. Wesley completes the canon with 23 original works written in the period between his departure from Exeter Cathedral to become organist of Leeds parish church in 1842 and 1874, the likely date of his final essays in the genre. Moving towards a greater simplicity of style, with less counterpoint and dissonance, but emphasising elements of colour, timbre and texture, these works are in general conceived on a more modest scale than earlier pieces such as The Wilderness. Even so, they show the composer continuing to experiment with the Anglican verse anthem, the evolution of which had been the cornerstone of a creative achievement without equal in the history of the English cathedral tradition between Purcell and Stanford.